My clients are almost all direct marketers. This means they ALL test like crazy. If you take a peek at my portfolio, you’ll see a wide variety of styles and formats. But it’s all direct response copy. Some clients want “pure” pedal-to-the-metal DR copy. Others want it toned down. Some use a format that’s built around graphics. As a direct response copywriter, one of my jobs is to give the client exactly the style of direct response copy they want. Because that’s the type of copy that converts…based on their testing data. I'm a direct response copywriter. I specialize in providing direct response copy for the direct marketing environment for clients around the planet. I specialize in sales page copy, landing page copy and copy that persuades readers to pull out their credit card and buy. Enter your info to the right for my free series: Seven Steps to High Converting Copy. Or contact me here if you have a project you'd like me to quote. I'm also a Dan Kennedy Certified Copywriter for Info-Marketers. The Dan Kennedy Copywriter for Info-Marketers Certification is awarded to professional copywriters who have successfully completed a course of study of preparation for such copywriting. This Certification has not been provided by an accredited education institution. It does not constitute endorsement of or liability for any individual copywriter by Mr. Kennedy or any companies or organizations affiliated with Mr. Kennedy. The client's relationship is solely with the individual copywriter retained via any agreement. I’ve been writing copy professionally since 1989. I’ve specialized in direct response copy for 10 years. I’ve read all the ‘must read’ books and I’ve attended seminars; I recently watched the Gary Bencivenga DVDs. Like most direct response copywriters, I’m always trying to get a little bit better every week. I use the ‘proven techniques’ and follow the rules of direct response copywriting. I have enough creativity to make a direct response promotion stand out from the crowd. Many of my promotions have established solid controls or beat established controls. Yet I’m the first to admit I really know nothing…until the copy is tested. If you’re a direct response copywriter, get ready for blood. Copy can sometimes fail miserably. I’ve had plenty of successes but I’ve written copy I thought would rock only to see it miss the mark by a vast distance. Direct response copywriters are, ultimately, salespeople. People who sell can come across as brash and arrogant, and, as such, I’ve met copywriters who are…well…confident. There must be a lot of arrogant copywriters. In fact, one copywriter gives 14 reasons to hire him. "Reason #6: I’m not a jerk." No copywriter knows anything until the copy goes live and the real experts weigh in. Arrogance in copywriting is believing you're an expert. Potential customers who read the copy. Are they providing valuable information? Are they pulling out their credit cards and buying? Are they making a telephone call? When the real experts have spoken, then I know something. I'm a direct response copywriter. I specialize in providing content and copy for the direct marketing environment for clients around the planet. I specialize in sales page copy, landing page copy and copy that persuades readers to pull out their credit card and buy. 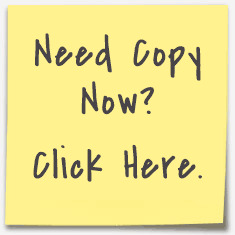 Enter your info to the right for my free series: Seven Steps to High Converting Copy. Or contact me here if you have a project you'd like me to quote. What's the point of investing in a new website? Just this afternoon, I received an email (unsolicited) from a company trumpeting the launch of their new website. It's beautiful and expensive (I'm certain) and the photos are professional. BUT...what's the point of the website? To get great search results? The site is for a chain of marinas. A marina makes money by renting slips and providing boat services. A marina needs leads; it needs a database of prospects; it needs repair business...and all the marketing 'juice' it can get to generate revenue from its core business. Any way to opt in to a database. If you feel so moved, check the site against my direct response checklist. Does this company want a pretty website or does it want leads and revenue? Cliché copy with no meat or CTA (shoddy). I don't blame the website company but I question the marketing knowledge of the decision maker at the marina company. Memo to all business owners: TELL YOUR WEBSITE COMPANY YOU WANT YOUR WEBSITE TO HELP YOU MAKE MONEY. Apologies for getting ornery and weepy, even. In future posts, I'll focus on websites that 'get it.' Send me examples. I'm a direct response copywriter based in Charlotte, North Carolina. I specialize in providing copy and content for the direct marketing environment for clients around the world. Enter your info to the right for my free series: Seven Steps to High Converting Copy. Or contact me here for a direct response copywriting quote.